Solera at Anthem in Henderson, Nevada is a beautiful active adult community by Del Webb. Located within the larger Anthem master-planned community, Solera at Anthem is situated beside Sun City Anthem, another Del Webb community. Views of both the Henderson Black Mountains and the Las Vegas Valley make Solera at Anthem a popular location for active adults aged 55 or better. The comfortable Solera at Anthem community is smaller than its Sun City Anthem neighbor, yet it does offer its own variety of amenities to attract adults who are interested in pursuing an active lifestyle in a beautiful setting. The activities found within Del Webb's Solera at Anthem begin at the 24,000 square-foot clubhouse. This spacious recreational facility offers a fitness center with state-of-the-art exercise equipment and an indoor swimming pool for staying in shape. The spacious clubhouse also offers a lounge for relaxing with a book, a catering kitchen for hosting a small get-together with your friends, and an arts and crafts room for exploring a new hobby. The amenities continue outdoors, allowing residents the ability to enjoy the year-round Nevada climate. Four bocce ball courts and four tennis courts are located on-site as well as an outdoor spa for relaxing during those cool evenings. The 1,822 homes at Del Webb's Solera at Anthem in Henderson, Nevada include both single-family and attached models. Single-family homes are designed with five different floor plans, ranging from 1,140 to 1,771 square feet. These homes have two to three bedrooms, two bathrooms, and an attached two-car garage, accommodating residents looking to downsize, though open floor plans give the homes a spacious feel. Attached homes come in duplex and triplex models, ranging in size from 1,519 to 1,590 square feet and featuring two bedrooms with a den, two bathrooms, and an attached two-car garage. Residents of Del Webb Solera at Anthem in Henderson, Nevada enjoy breathtaking mountain views in a community that overlooks the glittering Las Vegas Valley. Set 1,000 feet above the valley also provides a slight break from the summertime heat. Fitness training, including yoga, aquacise, and gym orientation classes are available to help residents get in shape and stay fit. For meeting the new neighbors, active adults at Solera at Anthem can join a variety of social clubs. Solera at Anthem offers arts and crafts for the creative residents, an astrology club for the curious, hiking for the adventurous, and poker tournaments for the competitive. At Solera at Anthem, it's easy to stay active all year. Perched 1,000 feet above the Las Vegas Valley, Del Webb Solera at Anthem in Henderson, Nevada enjoys beautiful views of both the valley below and the adjacent mountains. As part of the larger Anthem master-planned community, Solera is set in a prime location with many local shopping and dining opportunities. The Las Vegas Strip and McCarran International airport are conveniently located less than 30 minutes away. For golf lovers, the Revere Golf Club is an award-winning public course that is located only a few minutes from Solera at Anthem. Lake Mead and its hundreds of miles of shoreline is only 30 miles to the east, and two large shopping malls are within 15 miles of the community as are two hospitals. 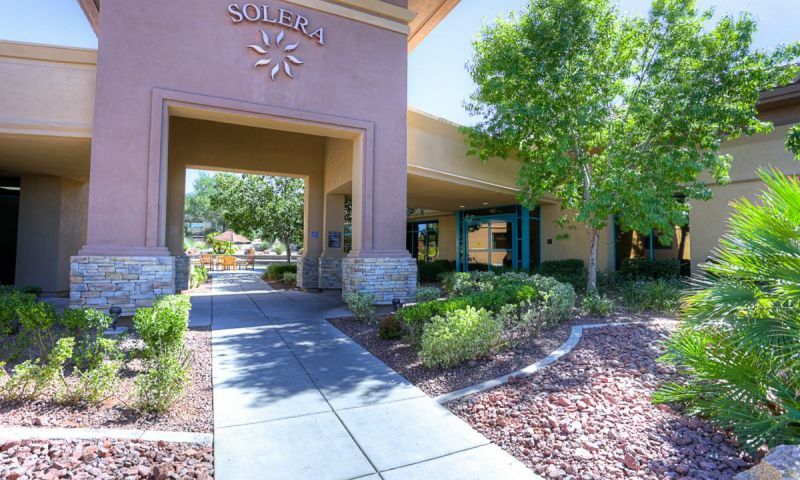 Active adults in Henderson, Nevada don't have to look further than Solera at Anthem to find their perfect 55+ community. There are plenty of activities available in Solera at Anthem. Here is a sample of some of the clubs, activities and classes offered here. The Villas are single-story attached homes in Solera at Anthem. There are a total 88 units arranged in duplex and triplex configurations. Homebuyers can select from two floor plans that range in size from 1,519 to 1,590 square feet and offer two bedrooms, two baths and an attached two-car garage. These models were built between 2006 and 2008. There are five single-family floor plans to choose from in Solera at Anthem. These intimate homes are sized for homebuyers who want small to mid-sized single-family homes with 1,140 to nearly 1,800 square feet. The single-family homes in Solera were constructed between 2003 and 2008 and feature two to three bedrooms, two bathrooms, and an attached two-car garage. Great place to live as either a full time resident or to escape the evils of northern winters. Lots to do in the 27000 sq. ft. + recreation centre with something for everyone. Homes are well appointed and not overly expensive. Tax rate is low as well. Nicely situated above the heat and pollution of the lower valley, but close to all amenities. Solera is a great place to live, either as a primary residence or as a vacation home. The recreation centre is incredible, offering something for everyone including top of the line exercise equipment in a well designed work-out area. The houses are very reasonably priced, currently (Aug 1, 2012) at about $110 per sq. ft. The designs are functional and make for pleasant living. Multi-use trails, lots of recreational facilities, theatres, and of course all the things Vegas is famous for are within a 30 minute drive including the Strip and Freemont St.
Everything you need on a daily basis is available in shopping areas that are close by and there are hundreds or eateries to save you having to do dishes. HOA is low, currently $60 a month. Taxes are low. Utilities are low. Living is great. we love it here! It has been 6 years and I am still waiting for the PROMISed OUTDOOR POOL. Any idea when this will come into play? 55places.com is not affiliated with the developer(s) or homeowners association of Solera at Anthem. The information you submit is distributed to a 55places.com Partner Agent, who is a licensed real estate agent. The information regarding Solera at Anthem has not been verified or approved by the developer or homeowners association. Please verify all information prior to purchasing. 55places.com is not responsible for any errors regarding the information displayed on this website.